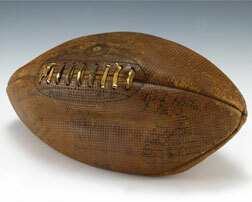 Dark brown, leather football signed by the 1932 University of Michigan football team. Signatures include such notables as athletic director F.H. Yost and future President Gerald R. Ford.